To identify which hand drying method is preferred in the U.S., Cintas Corporation commissioned a survey conducted online by Harris Poll, May 19-23, among 2,048 U.S. adults ages 18 and older. 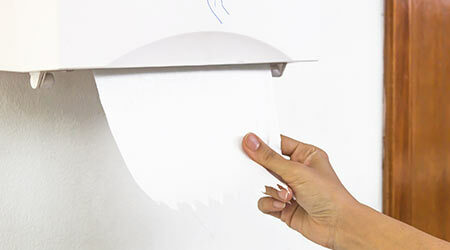 The study found that the majority of American’s (69 percent) prefer to use paper towels over air dryers when drying their hands in public restrooms. Paper towels are not only more hygienic, but they are also better for the health of restroom users’ ears. In fact, jet hand dryers have the same impact on ears as a close-range pneumatic drill, and are especially dangerous for children’s ears as air dryers are typically positioned at the same height as a child’s head[ii]. The survey also found that age is a factor in the paper towels vs hand dryer debate. Seventy-six percent of Americans aged 35-44 prefer paper towels compared to only 60 percent of those aged 18-34. Additionally, women are more likely than men to prefer paper towels with 73percent and 66 percent, respectively.